There. It’s out. I’ve said it out loud. I have a big old crush on retired Canadian astronaut Chris Hadfield. And my husband is okay with it. Of course, I’ve never actually MET the man, and I’m sure he has a dark side the public doesn’t see, just like the rest of us; but he’s just so darned interesting! It’s a “brain-crush” kind of thing. As cool as it was to see his performance of David Bowie’s classic song, what fascinates me about him is how he speaks and writes about his perspectives on life, and how he sees the world. This man has had the courage and tenacity to do things that few people on the planet will ever achieve. And for all the rigorous scientific discipline and exactitude that his profession required, he seems to possess a spirit as expansive as outer space. And that’s what I find really engaging. Over the holidays, I had a chance to hear Cmdr. Hadfield answer a version of the Proust Questionnaire on CBC Radio’s “The Next Chapter.” His answers were thoughtful. They sparked in me all manner of curiosity and introspection, and caused me to reflect on how I relate to my work and my world. After a what felt like a tough year of growth and change which had left me feeling tired and depleted – I move into 2014 feeling inspired. What I learned: This was, for me, a reminder that to achieve great things, one must travel the unbeaten path. Educate yourself, dream HUGE and move heaven and earth to achieve your goals. What I learned: I loved these words from a man who has journeyed farther than most! I work in a world where the word “journey” is overused, over-romanticized and creates in my mind the picture of something “precious.” We are all precious. We all have stuff to offer. Let’s lose the “glowing aura” and just get on with things. I love a little mystery, a little magic – but not when the stories get in the way of getting things done. Open hearts, open minds, respect, commitment – and let’s get to work! What I learned: Yeah. That. Chris Hadfield’s autobiography: “An Astronaut’s Guide to Life On Earth: What Going to Space Taught Me About Ingenuity, Determination, and Being Prepared for Anything” is a wonderful tale of facing the impossible, and finding a way to get it done. He’s humble, optimistic and funny. If you’re looking for a little inspiration, give it a read! What inspires and motivates you? How do you get passed the “impossibles” in your life? If you feel like sharing, leave a comment in the space below. I’d love to hear how you’d answer some of these questions. 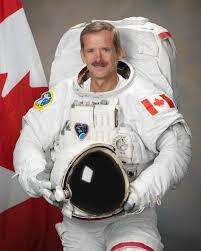 And thank you, Chris Hadfield, for sending me into 2014 with my heart and brain on fire with renewed energy and creativity! A little rest and some thoughtful words, and I’m ready to fight whatever dragons come my way. Wow! I love his answer about his greatest achievement – and your additional thoughts. That is why I do what I do as well! I don’t know anything about him, but I am going to listen to the interview. Thank you for sharing! Chris Hadfield is a bit of a celebrity here in Canada, and he’s a pretty inspiring guy! There’s nothing like seeing a light appear in someone’s eyes is there? It’s why I do what I do too, Emily. New experiences, deeper meaning – I’m so lucky to have the opportunity to work with people in this way! I can absolutely relate that my ‘greatest achievement’ is not earth shattering as far as the world is concerned. But helping one woman to become the mother that she’s always wanted to be… that is a BIG deal to that particular woman. It can be the hugest deal to that individual that we are helping. Looove this! Thank you, Susannah, for introducing me to your “brain-crush.” Each answer accompanied my your reflection went strength to my heart and I can still feel the words swirling around! What a beautiful perspective you shared with us. I have put his book on my Amazon book list. I look forward to reading more about him…my son is gonna love him too. I’m so glad you liked it Tricia! My son thinks Chris Hadfield is cool too. Definitely a recommended read! Your payment will show as a payment to “MOVING SPIRIT” on your credit card statement. If you’re an active person who’d like to move with more ease and less pain, if want to be confident that you’ll be able to play as hard as you want to play for years to come, or if you just want to feel really good in your body – then you’ve come to the right place. You are on your way to experiencing your BEST moving body. COPYRIGHT 2019 MOVING SPIRIT | ALL RIGHTS RESERVED.